“Welcome back to campus, seniors! Make sure to visit our career services office and perfect your resume in preparation for job applications this fall.” This is a statement that is preached by every career coach throughout the nation to college seniors. Bring your resume up to date is an essential task when you get back to campus for your senior year. 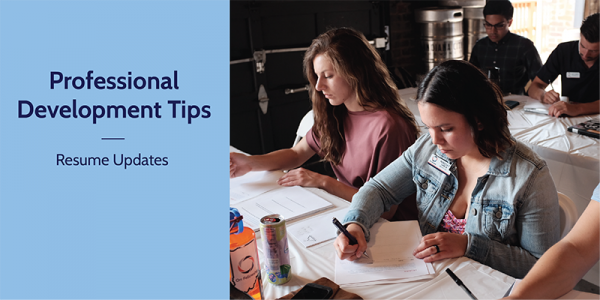 It is important to make updates shortly after a summer internship or job is still fresh on your mind, so you can highlight what was truly important about those experiences. Once your resume is complete, is it time for the full-time job search? Not exactly. There are a few important steps to take before you sit down with a recruiter. You can easily search for jobs and submit an application, but there is something incredibly important you must do with your newly polished resume: you need to study it. Understand how each position on this document has shaped you and what your resume as a whole says about you. This will give you the ability to talk at length with recruiters and interviewers about yourself, your experiences, and why you would be a good fit with their company. So, how can you start this process? The key is to start asking questions like, Why was it valuable to take on that leadership position in college, or spend a summer interning in Indianapolis? What did you take away from this role? How did the work you contributed to that organization shape who you are? These are just a few questions to ponder and help you better understand your own resume. In short, yes, it does. The reason why you need to comprehend your resume is because it will help you better understand yourself, what types of jobs are best for you, and eventually help you nail the interview. Knowing who you are is valuable. It gives a level of clarity into what makes you happy or unhappy, how far you can truly push yourself, and shows where your strengths and weaknesses lie. This feeds directly into the next step of the job search: realizing what jobs are best for you. If you know yourself then you have the ability to apply to jobs that will yield the best opportunity for long-term success and happiness. Applying to a job that is best suited for you will get you excited about the opportunity, which will feed into your ability to talk about your resume and allow you to have great success in your interview. Now Seniors, go get your resume updated!